Last Tuesday, I had a chance to go up to the city to see Bjarke Ingels of BIG (the architecture firm) be interviewed as part of the City Arts and Lectures series. I’ve portrayed some of the work of the firm’s work here before, and am (nearly) always delighted at the solutions they create. 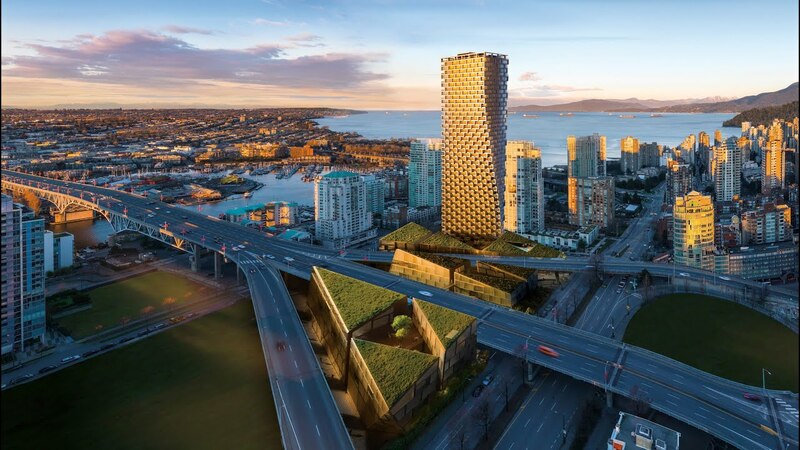 Turns out they’re doing a new residential development in Vancouver, right near the bridge that leads to Granville Island (a place that is of itself a very nifty place, a great urban market, I love it there). And as expected, it’s no typical building. 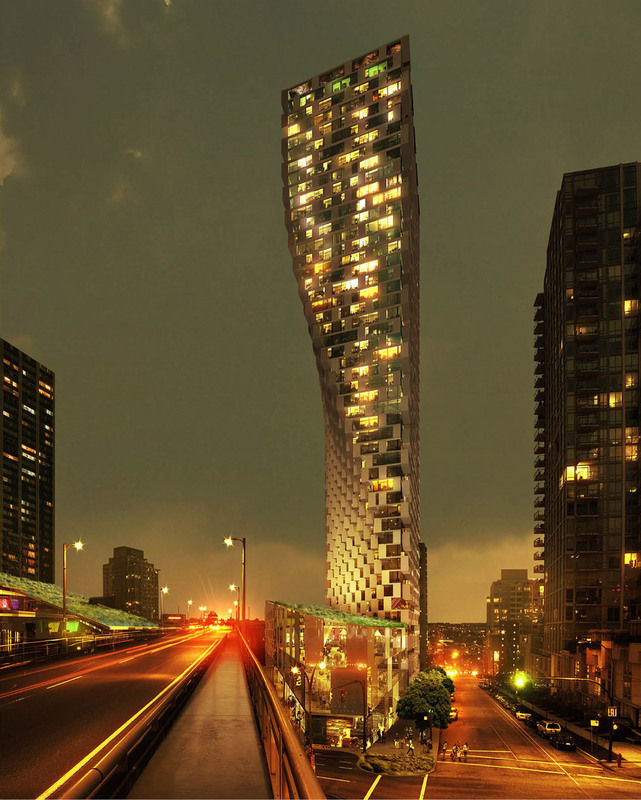 Just as the Flatiron building in New York City was a response to the shape of its site, and the unique conditions of its place and time, so too does Vancouver House. The main tower is a bit puzzling at first, from certain angles, given the way it grows from a narrow base that seems, shall we say, unstable. But after that first shock, it unfolds nicely into rich and textured (almost like a woven mat) edifice, with an even niftier base. This is the part I like the most about the project. 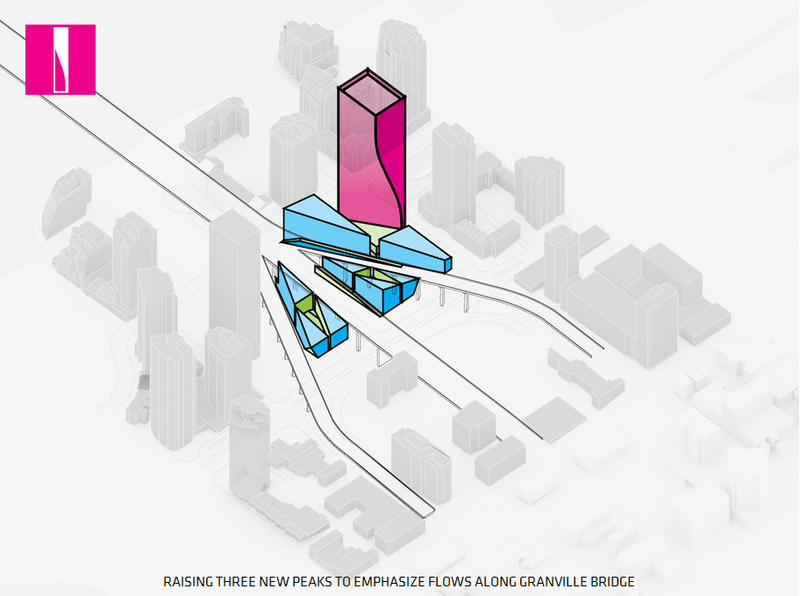 Rather than a monolithic and blocky plinth for the tower to sit on, the building rises up in the spaces created by the branching structure of the bridge ramps. Further split by pathways and courtyards, a kind of artificial geography is created (reinforced by the green roofs), with plenty of windows to engage the street and parkland created. Which may be my second most favourite thing about this project. Underneath this bridge, the space is being tuned into an actual art gallery, with huge light-boxes hung from above to display an ever-rotating collection of artworks created by the students from the nearby art college on Granville island. It’s a new use of the space that takes advantage of and comes alive because of the heavy bridge and shaded environment , not in spite of it. It’s using what’s there for its strengths. The whole project is a creation and reflection of the constraints of the site. The delicate curve and shape of the residential tower came from the requirement of minimum distance from the bridge to any housing unit, as well as preserving light into an existing adjacent park. It’s a design that comes from play, clearly, but play that teases out a design only after rigorous research and exploration of intention. During the lecture, the interviewer intimated that, “your work ends up being almost too clever, but it isn’t. It never crosses that line and becomes crazy. At the same time, there feels like there’s a simple idea of clarity that is carried through.” I’m excited to see how well this project turns out in completion, and how well it manages to capture (or not) the elegance of the renderings and the ideas. Guess I’ll need to visit Vancouver again!